Forest School is a specific type of outdoor learning, defined by the Forest School Association as “hands-on learning experiences in a woodland or natural environment with trees”. Over the past 15 years, an increasing number of schools across the UK have adopted the use of Forest School and therefore there is a need to assess its impact on children’s education. While this study’s purpose is not to assess the effectiveness of Forest School in general, its case study approach aimed to provide insights into the capacity of Forest School to develop children’s learning dispositions – the skills and attitudes that allow children to become lifelong, motivated learners. Furthermore, due to the limited access to woodland, this study evaluated the effectiveness of Forest School in a “less wild” playground setting. Current literature on the impacts of outdoor learning, and specifically Forest Schools, highlight the potential for such programmes to develop children’s personal and emotional development (Dillon et al., 2005). One large study showed positive impacts on children’s confidence, social skills, language, concentration, physical skills, and knowledge and understanding, but only if there was regular and repeated contact with the outdoor environment (O’Brien and Murray, 2007). Whitehall Primary School is a mainstream, inner-city primary school in Bristol. The school is larger-than average with over 400 pupils – a large proportion of pupils coming from minority ethnic backgrounds and a higher than average proportion of children eligible for pupil premium funding. An external Level 3 qualified Forest School practitioner provides Forest School sessions on the school site to Years 4, 5 and 6. The area used has a log circle and is enclosed by a few trees on a grassy area. This case study followed the strong model of teacher professionalism, in which teachers used evidence-based research to critically inform their own practice (Taber, 2007). Participant observations, focus groups, and questionnaires were conducted over a 10-week period, in which two Year 5 classes had fortnightly Forest School sessions on site, each lasting for 2 hours. Teachers and Teaching Assistants acted as participant observers, focussing on improvements in learning dispositions, including the confidence, perseverance and social skills of a group of six children. These were observed before, during and after the Forest School programme. Focus groups and interviews were then conducted with these children and the teachers and Forest School practitioner involved. Finally, questionnaires were completed by over 100 children in both Years 4 and 5. Participant responses were identified and categorised into key themes, including viewpoints relating to social skills, confidence and perseverance; how this helped children in the classroom; and the benefits/limitations of the playground setting. Comprehensive interpretation then involved identifying relationships and links between other forms of data and finally, comparisons and conclusions were made within the context of other literature.  The majority of children (over 90% in both Years 4 and 5) value Forest School as an enjoyable experience. This was particularly due to the practical skills they developed through using tools such as peelers, pruning shears, knives, fire flints and hand drills. The physically active element and the freedom to move around in the space were also important to them.  Confidence in children, especially those who are less confident in the classroom, improved over the 5 weeks. This was encouraged through the practical activities, as well as through providing activities that were achievable at different levels and allowing children to explore them in their own time and manner.  Nearly all children displayed greater willingness to interact with their peers. Children highly valued the opportunity to work in different partners and groups and “form new friendships”.  Some children showed improvements in their ability to persevere with a task. This was encouraged through the use of practical and enjoyable activities.  Teacher assessments of children’s dispositions before and after the five sessions showed that children had made improvements in their confidence, concentration and, in particular, their ability to work with other children. 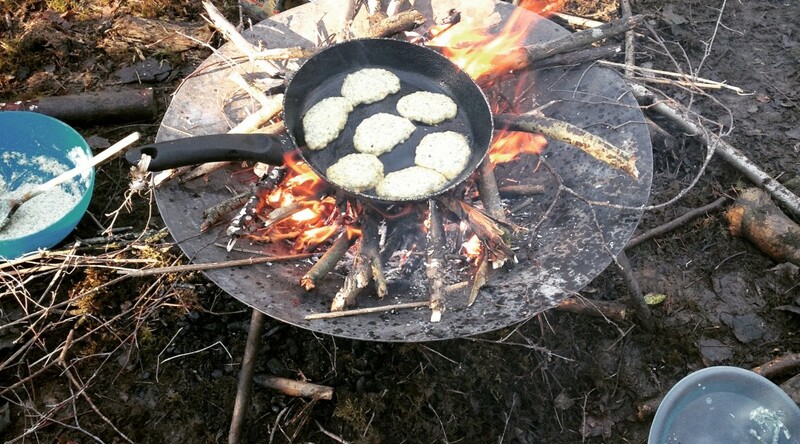  Children’s writing about their Forest School experience (making bread) showed marked improvements in both literacy skills and motivation. Using Forest School as a stimulus for writing was not a focus of the study, but would make for interesting future action-research.  However, most children did not identify the link between Forest Schools and their learning in the classroom. This highlights the need for teachers to reinforce the social and emotional skills developed in Forest School sessions back in the classroom.  A log circle, a few trees and a small expanse of grass, as well as extra resources brought in from outside (such as cuttings from trees) allowed a variety of typical Forest School activities to take place: fire lighting, miniden building, clay faces, nature trails, bug hunting and bread making. This highlights the potential of Forest School to be delivered in nearly all school settings, not just those that have access to a woodland.  However, there were clear limitations of the space: Opportunities for risk-taking were reduced as children could not tree climb or explore larger areas independently; children were more easily distracted and had less stimulation and resources required for longer periods of perseverance; and they were less immersed in a rich natural setting. 1. Ensure older children continue to have opportunities to build on the skills needed to be effective learners. This could mean ensuring they participate in Forest School each year and linking this programme to the PSHE curriculum to further embed their affective learning in the classroom. 2. Investigate local woodland areas as potential settings for more wild Forest School sessions, perhaps for particular children who require a more challenging and physical environment. 3. Investigate the potential to embed Forest School more formally into literacy units by designing a scheme of work around the activities. This is in line with the cross-curricular and experiential nature of the primary curriculum. Forest School has many similarities with the Early Years Framework, which puts emphasis on the development of positive learning dispositions through “igniting children’s curiosity and enthusiasm for learning, and building their capacity to learn, form relationships and thrive”. This study has shown that even in an urban setting, Forest School can provide older children the opportunities to continue to practise these qualities throughout their education and become lifelong learners.